Hana Gittelman who was on Heroes in Season 1 and has been featured in the comics alot is now again asking for your help and also giving you some stuff while she tracks down “Richard Drucker” who featured in a comic quite recently called “The Last Shangri-La” which was a bonus comic, he like Hana can intercept and generate digital/radio frequencies. She asked you to watch a video over at her blog which is a news article from Global News where they describe him as the “godfather of the internet” and is worth billions of dollars. Takezo Kensei : Sword Saint is nominated for best Webisode. Heroes Character Profiles are up for best Web Extras. The collection is published by the DC Comics imprint WildStorm and is available in two different covers by comics icons Jim Lee and Alex Ross. It also includes all of Tim Sale’s artwork from the series. Season 2 graphic novels are now posting weekly at NBC.com/heroes, expanding the fan experience with plot scoops not seen on air. This week’s novel looks at a future where the Shanti virus has swept across America and features Howard Lemay (a new character introduced in last night’s episode, played by Mark Harelik), who is seeking sanctuary with his family at a quarantine site. Later this month, watch for details on DL’s heroic — but tragic — career as a fireman trainee (Nov. 12), a flashback about young West and his “bagging and tagging” by HRG (Nov. 19), and even heroes doing their thing during the Revolutionary War (Nov. 26)! Thanks to Oliver from Titan Magazines for sending me the HQ Cover of the First Issue of the Magazine! and some stuff that will be in it. The wait is finally over! 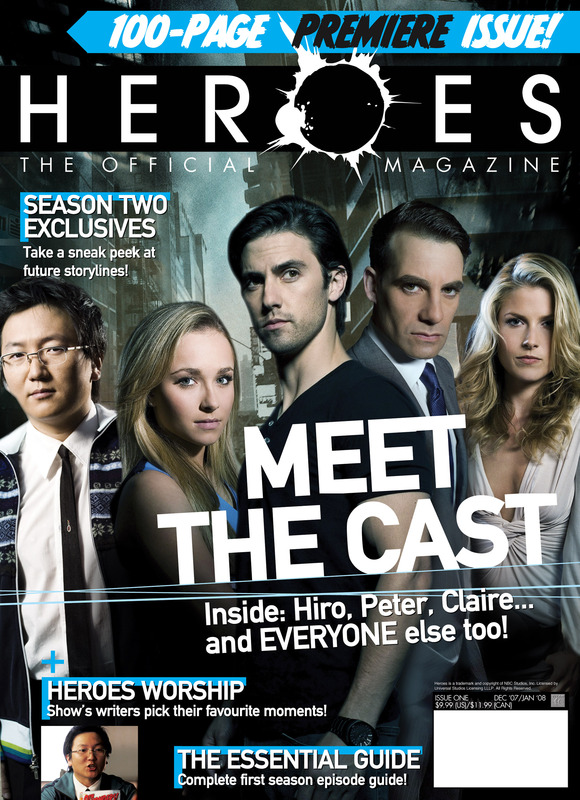 The all-new Heroes Magazine has arrived! Titan Publishing Group is proud to announce the release of the brand new Official Heroes Magazine on sale 15th November 2007 in the UK and 20th November 2007 in the US. The magazine will be taking you behind the scenes on TV’s most exciting new show. 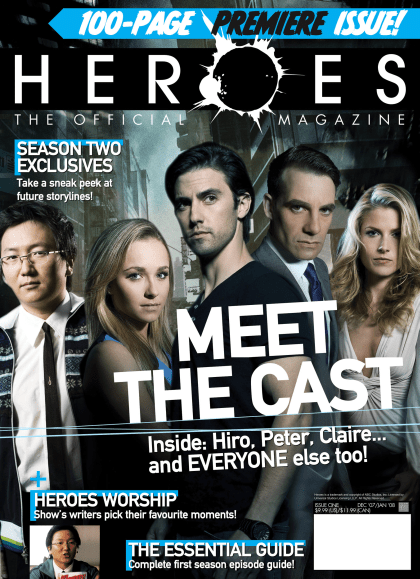 In this special 100-page first issue we will be speaking to Milo Ventimiglia, Hayden Panettiere, Masi Oka, and well, actually, all of the Heroes cast and crew and getting behind-the-scenes insights into the world of Heroes. We will also be talking to the show’s creator Tim Kring. He will be talking to us exclusively about the exciting first season and the show’s success, and he’ll be providing an exciting sneak peak of what the second season holds! Also in this amazing first issue, we will be taking an in-depth look at the Heroes online comic and talking to its writers and artists. We have also been following the cast as they traveled on this year’s Heroes World Tour, so we’ll be sharing the highlights and showing you some cool, exclusive photographs. Make sure you check out the Official Site for the Magazine and Subscribe to never be without your Heroes Goodness! TV Guide recently posted a new cover for the Heroes Graphic Novel Collection and I have to say its pretty nice. The book itself features the first 34 of the Novels that are posted on NBC website. Also features an intro from Masi Oka. The Graphic Novel itself is released November 7th! This probably doesn’t work so click here if it doesn’t play!! !